Ancient Athens, then a 3 day cruise to Mykonos, Kusadasi, Ephesus, Patmos, Santorini & Crete; independent adventure with flights & hotel included. Optional Classical Greece extension. Athens, then a 4 day cruise to Mykonos, Kusadasi & Ephesus, Patmos, Rhodes, Santorini & Crete; travel on your own with flights & hotel included. Optional Classical Greece extension. 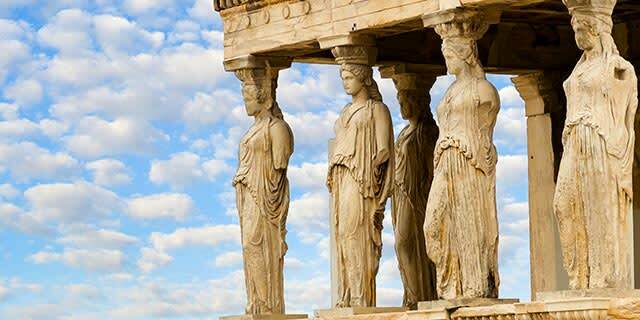 Athens, then a 7 day cruise of the Greek Isles plus Kusadasi for Ephesus; independent travel with flights & hotel included. Optional Classical Greece extension. 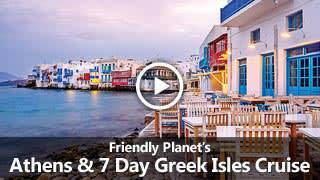 The ancient capital of Athens, then 2 of the magical Greek Isles: Mykonos & Santorini; travel independently with flights, hotel & ferry included. Optional Classical Greece extension. 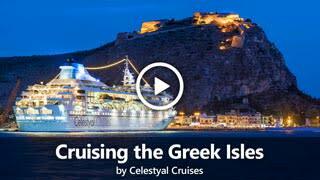 Already booked on one of our packages to Greece? See everything you need to know before you go. U.S. citizens must have a passport which is valid for at least 90 days after your return date, though we strongly recommend at least six months. 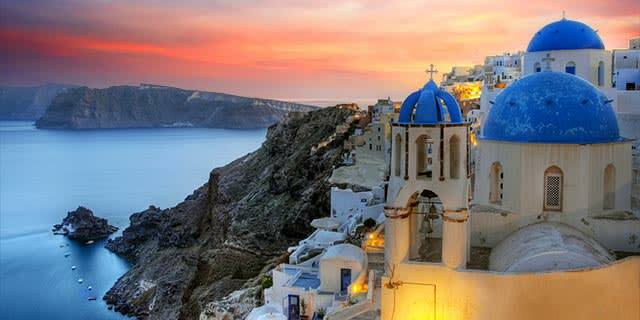 U.S. passport holders do not need a visa to enter Greece for stays up to 90 days. See the U.S. Dept. of State website for more information. There are no health requirements for entering Greece. However, you might want to consider getting a hepatitis vaccination. 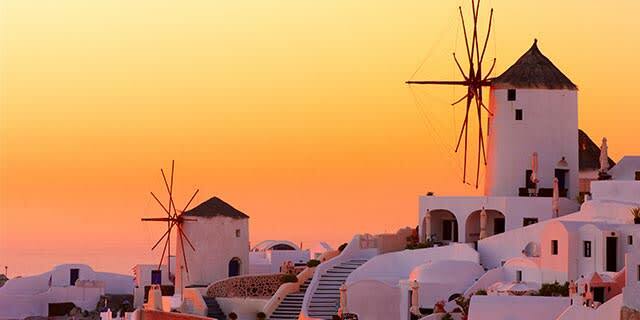 Ask your physician when planning a trip to Greece. Greece has fairly good weather all-year round with very little rain. Peak tourist season is June through August with temperatures getting into the 90's. 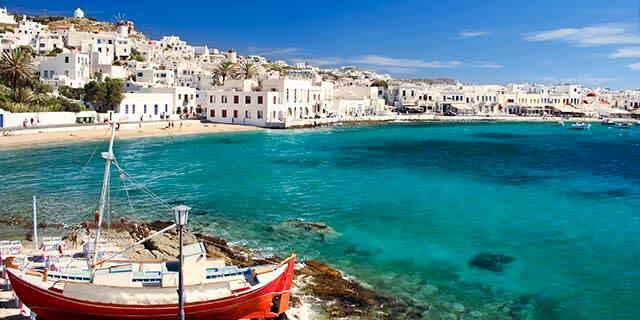 May and September are optimal months to travel to Greece, avoid tourists and still enjoy the wonderful weather. Winter is still nice for touring but the water tends to be too cold to swim in. Restaurants include a 15% service charge, and additional tipping is always welcome, but not required. Leave a small tip for the busperson. Concierges and hotel receptionists, around 3 euros. Tip guides 2 euros, doormen 1.5 euros, barbers 10%. ATMs are prevalent in Athens. In Greece, shop for pottery, lace, rugs, wines, embroidery, gold jewelry with Greek designs, and silver jewelry with precious stones. In Crete, look for handbags and harps. In Rhodes, ceramic tiles. 220 volts. Plugs C, D, E & F. You will need a voltage converter, and plug adapter in order to use U.S. appliances. We recommend getting a universal adapter and converter kit. View more information about electrical standards around the world. Check out our blog for our latest articles on Greece.